Eat Your City: Heritage Days, Edmonton, AB - Heritage Festival 2012 Part 2 of Day 2 and 3 with food, drinks and performances from 60+ tents and 80+cultures!! 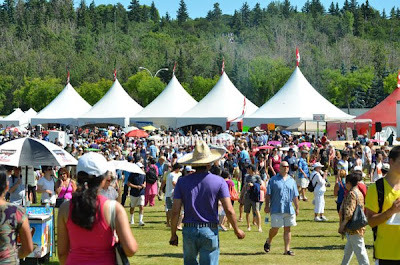 Heritage Days, Edmonton, AB - Heritage Festival 2012 Part 2 of Day 2 and 3 with food, drinks and performances from 60+ tents and 80+cultures!! Due to some commitments, we went briefly for Sunday's festivities, and went back for a few hours on the last day of Heritage Days to much on some of our favs we either missed out on the first day or we simply wanted another taste as the cultural displays, performances and food during Heritage Days only happens once a year during the August long weekend! Click here for Part 1 2012, Part 2 2012.. and now one to the finale! First up was this yummy and new fav: Gozleme from Turkey ! 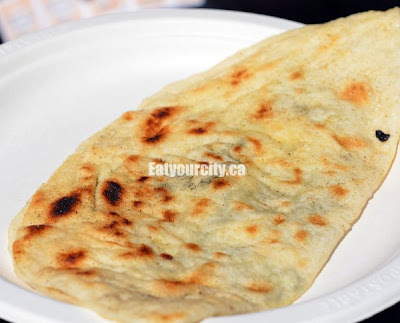 This little unassuming thinly stuffed potato pancake is packed full of flavor. You can get it in many varieties - vege, meat - ours was feta cheese and spinach. Delicious! At the Israel tent, I got one of my favs...their falafels! 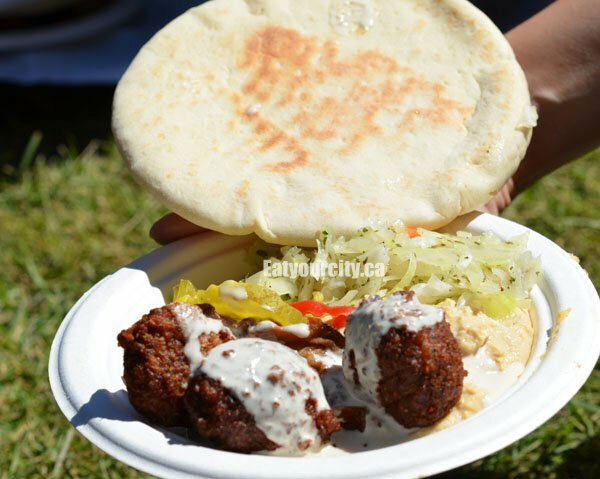 This year's Falafel Plate included a blob of hummus, lemon cabbage slaw, fried eggplant and pickles served with a thick Israeli pita and fried chick pea balls, drizzled with tahini sauce. 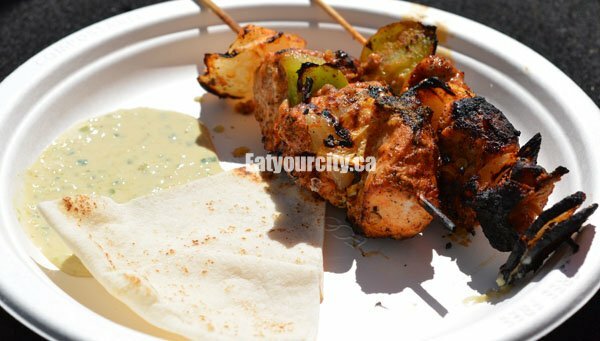 I liked it better last year when they slowly grilled the eggplant over coals until it was completely caramelized, but still a tasty falafel! 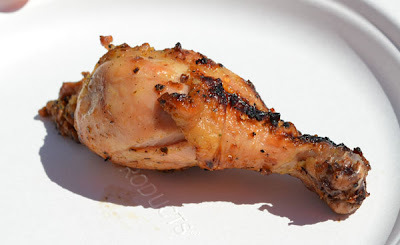 And their chicken was lovingly seasoned with a hint of chilis and lots of lemongrass. So moist and tasty! 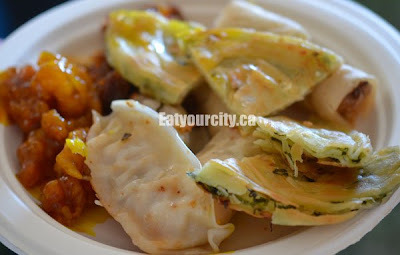 Next stop was Taiwan for a platter full of crisp savory spring rolls, soft-crisp green onion loaded up green onion cakes, panseared dumplings and ginger beef. Mmm! Our friends also picked up a Taiwan Mashu or rice ball dessert – soft sticky sweet smooth rice exterior topped either with shredded coconut and sweet green bean paste inside or topped with toasted sesame and a sweet black sesame seed paste inside! 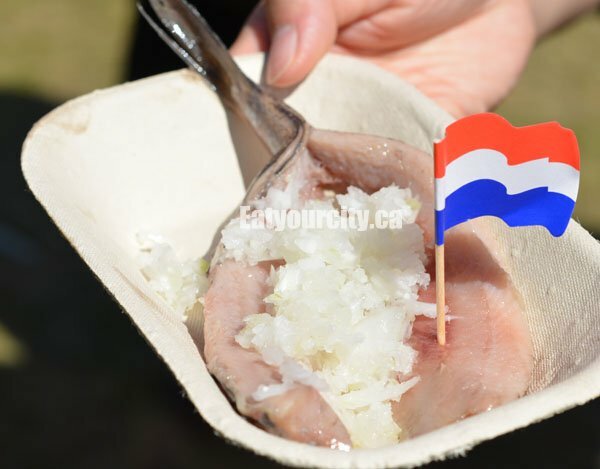 The Maatjes Haring – Salted herring garnished with chopped onions from the Dutch pavilion were so tasty, we had to return for them. This time, we had it without the bun and ate it the "proper" way: pick it up by the tail and pop it into your mouth! Mmmm.. 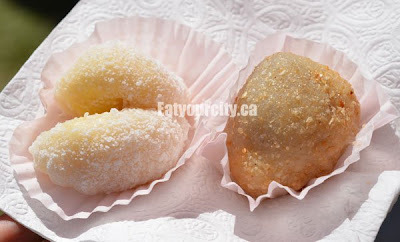 Anyone know where I can get more of these in Edmonton? 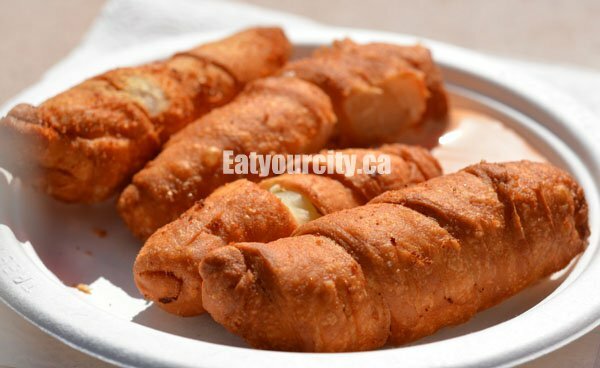 I can eat these everyday! It was a beautiful day to bring out the family, watch the cultural performances, and try new and fav foods! Kudos to all the volunteers wearing their traditional clothing in the heat! Kudos to this fella at the Irish pavilion too.. he was wearing facial hair too! 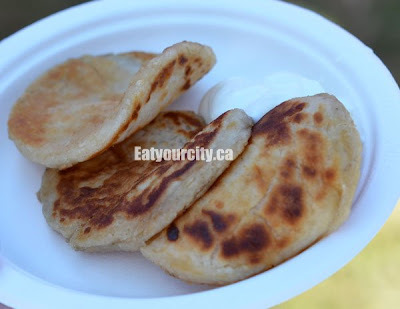 We snacked on Potato Cakes from the Irish tent, and weren't disappointed with these simple and hit the spot seasoned mashed potatoes patties. I think they were served with sour creme, but I finished mine by the time I realized there was something to dunk it into! 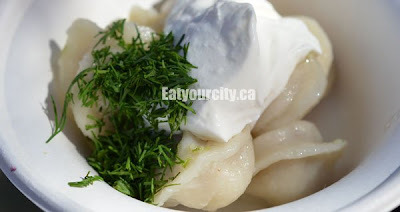 At the Russia tent, we snacked on some Pelmeni dumplings stuffed with chicken and served with a generous blob of sour creme and lots of freshly chopped dill. Mmm.. Like perogies, but more meaty! Finally, to end our day, we had a cumin scented and mildly spicy Sambusa from the Eritrean tent. 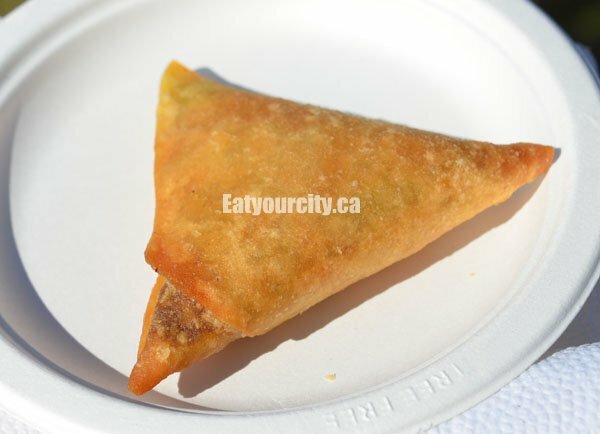 Simular to an Indian samosa in that it had lots of ground goodness in it - but all meat and no potatos... although a vegetarian one is available as well. Nom! :) So that concludes another year of Heritage Days! 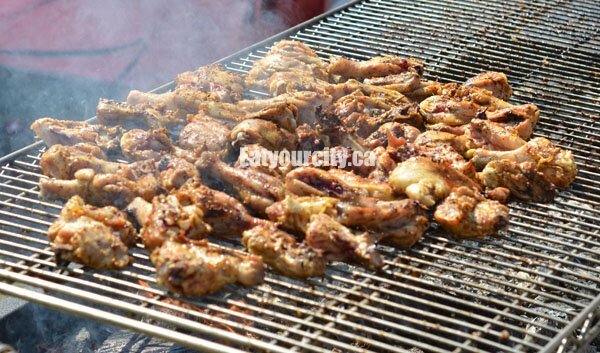 See you all next August long weekend!!! My friends and I truly enjoyed the wonderful food and special drinks. When we left the Festival, we went for one alcoholic beverage and a few of us seemed to experience some strange side effects. 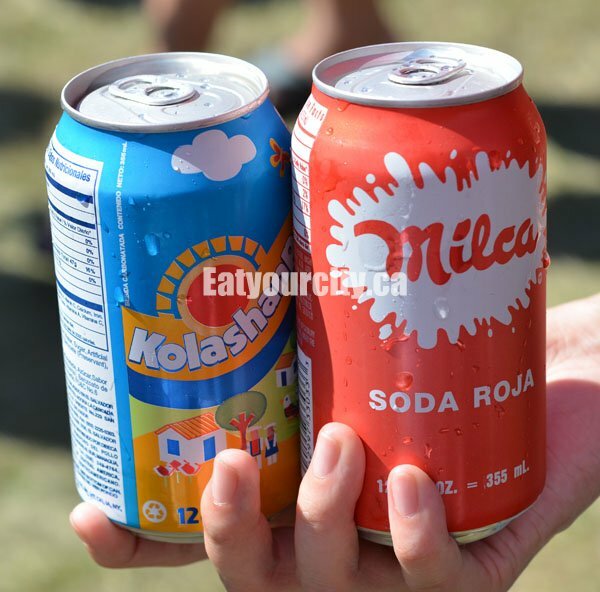 The last thing we had before leaving the festival was a healtly energy milkshake that tasted fabulous. 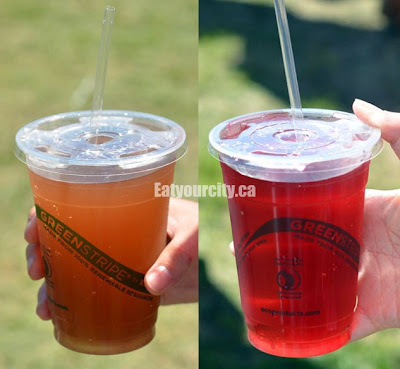 Wandering if energy drinks and alcohol could cause a problem. Did anyone else find this. Maybe a squooch too much sun and not enough fluids and shade? It was pretty darn hot out that year, and hard to stay hydrated despite spending probably 1/2 our tummy space on cultural drinks.. hope you felt better fast afterwards!! No I am serious, there were 9 of us. 5 people had the healty energy shake and they all had a strange reaction after drinking one alcoholic beverage. Dizzy, trembling. We left the festival at 6:30, walked to a pub by the U of A and left the pub at 7:45. I have heard that high energy drinks and alcohol do not mix. Does anyone know about that.